The NBA announced today that it has selected Sacramento Kings guard De’Aaron Fox to participate in the 2019 Taco Bell® Skills Challenge. Fox is averaging career-highs of 17.5 points (.465 FG%, .368 3pt%, .728 FT%), 3.7 rebounds, 7.1 assists, 1.71 steals and 31.5 minutes per game in 52 contests (all starts) in his second NBA season. He ranks seventh in the league in assists and steals, including at least one theft in 21 of the last 22 games. He has scored at least 20 points in 21 contests and tallied 30 or more twice, including a career-high 31 points to accompany 10 rebounds and 15 assists at Atlanta (11/1/18), making him the youngest player in NBA history to tally a triple-double with at least 30 points, 10 rebounds and 15 assists. Joining Fox in The Taco Bell® Skills Challenge are Mike Conley (Memphis Grizzlies), Luka Dončić (Dallas Mavericks), Nikola Jokić (Denver Nuggets), Kyle Kuzma (Los Angeles Lakers), Jayson Tatum (Boston Celtics), Nikola Vučević (Orlando Magic), and Trae Young (Atlanta Hawks). 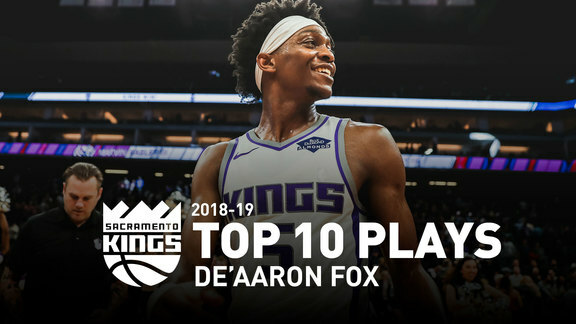 The inclusion of Fox marks consecutive seasons that Sacramento has featured a participant in the Skills Competition as Buddy Hield joined the field in 2018. They join DeMarcus Cousins (2016 and 2017) as the only Kings players in team history to compete in the event. In addition to the Skills Challenge, Fox will join Kings rookie Marvin Bagley III on Team USA and oppose World Team participant and Kings teammate Bogdan Bogdanovic in the Mtn Dew Kickstart Rising Stars game on Friday, Feb. 15 at the Spectrum Center in Charlotte, N.C. (9 p.m. ET).